While still a panel, it needs to be made into an actual television, and LG is going to do that in its full package next week at CES 2012. Today's press release reveals more about LG's 4-Color Pixel and Color Refiner technology it's implementing to bring consistent, accurate colors that it claims will beat other OLED TV's abnormal color gamut. While LG's press release doesn't mention production plans or pricing, all of this is squeezed into a frame that's just 4mm thick with a narrow bezel and weight of just 7.5kg (16.534 pounds). You can also expect full coverage of it from Techman's World, so make sure you really stay tuned. If you have questions on CES 2012, email us with the contact info that is at the bottom of every page. 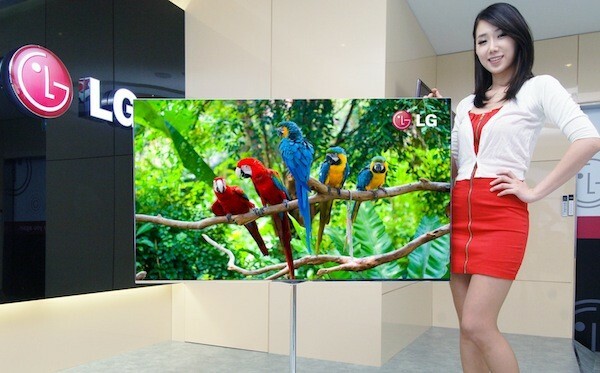 Below are some more press pictures that LG released, with one of its press ladies showing it off. SEOUL, Jan. 2, 2012 – LG Electronics (LG) will present the future of TV technology at the Consumer Electronics Show (CES) in Las Vegas with the unveiling of the world's largest OLED TV with a display size of 55 inches. 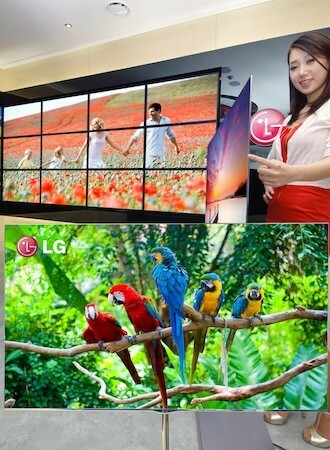 By incorporating the company's 4-Color Pixels and Color Refiner features with LG Display's advanced OLED (organic light-emitting diode) panels, LG OLED TV generates the most natural colors of any TV set at a much lower price point than could have been achieved using the standard manufacturing process. 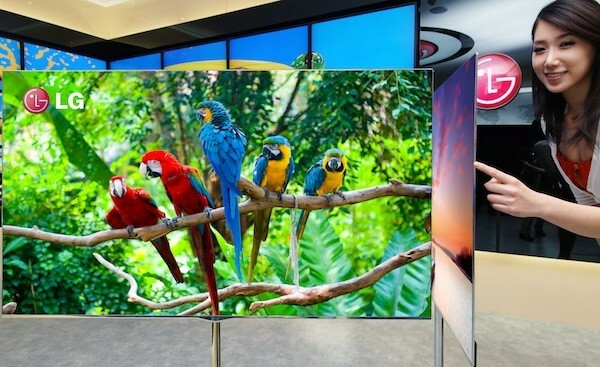 "Working closely with LG Display, we have a product which not only delivers on all the advantages of OLED over LCD but at a significantly lower cost than what could be achieved using existing OLED manufacturing technologies," said Havis Kwon, President and CEO of LG Electronics Home Entertainment Company. "OLED is clearly the future of home TV entertainment and LG is very focused on making this exciting technology as easy as possible for consumers to embrace." What sets LG's TV picture apart from other OLED TVs is 4-Color Pixels and Color Refiner which work together to generate natural and accurate colors that are sharp and consistent. The 4-Color Pixels feature allows for more accurate color depiction by using a set of four colors (red, green blue and white) in comparison to the RGB setup used by other OLED TV manufacturers. Color Refiner ensures consistency in colors from a wider viewing angle via an LG algorithm which improves and refines hues and tones. This is in contrast to other OLED TVs which often exhibit drastic changes in hues from different viewing angles and abnormal color gamut. Boasting an infinite contrast ratio, LG's OLED TV exhibits vivid colors and the smallest details regardless of the overall luminance of the on-screen image. In turn, colors and details throughout an entire image are preserved with utmost clarity and sharpness, even when displaying scenes with dark lighting. Such color capabilities are technically impossible with LED and LCD display panels. And at 1,000 times faster than LED/LCD displays, LG's OLED TV shows crystal clear motion without any blurring or bleeding. And LG's OLED TV is as aesthetically pleasing as it is technologically sophisticated. LG's Slim and Narrow Bezel design gives the TV a sleek, minimal look and at only 4 mm thin and a mere 7.5 kg, LG's OLED TV practically blends into the wall. What do you think about this TV now? Post your thoughts below.